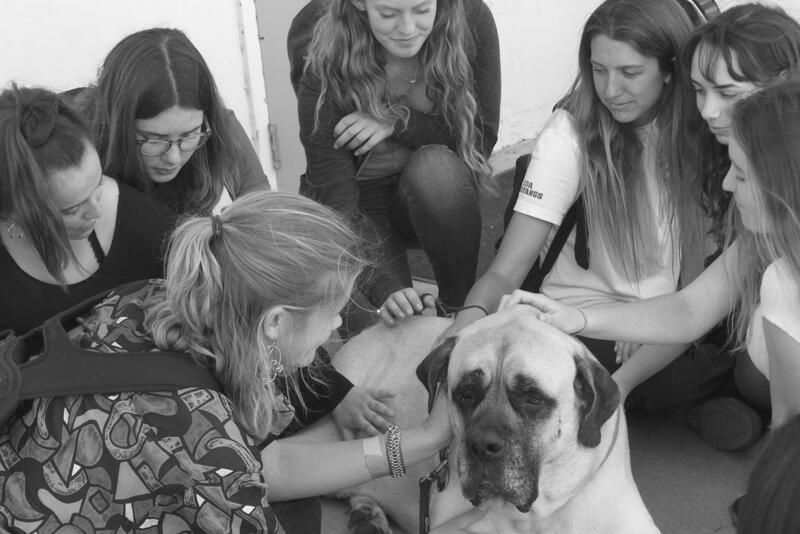 Students pet one of the dogs brought on campus as apart of the Canine Unwind area during last year's Exhibition Day. The schedule will be similar to previous years with 50-minute class periods and an hour lunch. There will be two 35-minute exhibition periods between first and second period, and two more between third and fourth. ASB and administration staff is also considering extending the event and some booths after school so that community and SDA Foundation members can participate. Several students complained that pamphlets detailing the Exhibition Day schedule should be distributed earlier than first period the day of so that they have an idea of what booths and to visit ahead of time. ASB teacher Rod Keillor suggested that the schedules be released the day before through the Remind text thread. There was a brief discussion of where the bands and live music performances should be located this year. The PAC, the Mosaic Cafe, and the Media Center are all possibilities. Forum participants agreed that booths selling food should only be allowed to sell handmade products as opposed to store-bought. This doesn’t apply to students selling or reselling other products like clothing. This Exhibition Day will feature a new collection exhibit, where students can display their collection hobbies: rocks, coins, stamps, whatever else is school appropriate. The location is yet to be determined but the lawn in front of the PAC was suggested. Students also advocated for more interactive booths and exhibits, like magic shows, so that more people will be involved and teachers feel more welcome to bring their children. ASB proposed the option for student vendors to donate part or all of their proceeds to local charities, like the Rancho Coastal Humane Society and the SAn Dieguito Alliance’s Canine Unwind, which will be bringing therapy dogs on campus again this May.